After 18 months of intensive planning we will soon begin our long journey to Ducie Island. This is a team effort and you are part of the team. Please help us to work you by reviewing this important information. https://share.garmin.com/VP6D Tracking will be available on Oct. 16th as we depart Mangareva. 3. As time permits, we’ll send Press Releases to the DX-bulletins and upload photos to VP6D.com from the island. 5. The pilots do not have the logs. Please don’t ask them about NiL, busted calls, skeds, etc. Do send them helpful suggestions. 7. The log will be uploaded daily, OQRS will be available at VP6D.com shortly after we leave the island. 8. The process for reporting busted / missing QSOs will be available when OQRS opens. 9. We are uploading the log only to VP6D.com - there is no Leaderboard. 11. DXA at DXA3.org/VP6D will update about 3 minutes after your contact. Check here to see if you are in our log. 12. The log may show FT8 dupes even if you didn’t dupe us, we will resolve dupes after the DX-pedition. 13. Thanks to Lance W7GJ our plan to activate 6m EME is a first for Ducie Island. There will be at least 3 DX-peditions operating from the Pacific during Oct/Nov. Ensure you are in the correct pileup for the DX you are trying to work. If you see your contact on VP6D’s DXA that contact is in our log. 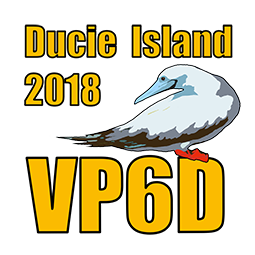 Please consider a donation at VP6D.com to help offset the team’s significant investment to put Ducie Island on the air. Those who process a donation on VP6D.com before we sail on 16 October will receive their LoTW confirmation while we’re on the island. We wish everyone the best of luck in getting in the log, we’ll do our best to get you the Qs you want.